12.28.13: Is Basic Materials the Sleeper Sector of 2014 ? We are starting to see a little life in the commodity sector. This weekend (12/28/13), one of my former fellow contributors on TheStreet.com, Helene Meisler (@hmeisler), posted this chart of the XME (under a “Guess This Chart” Tweet). Basic Materials is roughly 70% Chemicals and which a big chunk of that is presumably Dow Chemical (DOW) and DuPont (DD). The other 30% is where we are focused and is what I call the non-precious metals or aluminum, copper and steel (and such). Readers can clearly see the boom-and-bust cycle within the sector, some of which undoubtedly can be attributed to the slowdown off the 2008 Recession (not to mention the slowing of the Chinese economy from the mid 15% quarterly GDP growth rate in the mid 2000’s, such as 2006 and 2007), to the point where we are today, with q3 ’13 about finalized, and the developed economies poised for better global growth in 2014. Looking ahead into 2014, what are the expectations for Basic materials earnings growth as a sector ? To be clear, the revisions are still negative for the sector, which means as we move closer to each quarter, the expected earnings growth rate gets revised lower. For example, for q4 ’13’s current +6.9% expected growth rate, the same growth rate was 23% on July 1 ’13. What I’ll be looking for from a sector perspective, is for the actual growth rate to start exceeding the SP 500 quarterly growth rate. Basic Mat’s earnings growth rate has not materially exceeded the SP 500’s quarterly growth rate since q4 ’12, when the sector grew 13.7%, versus the SP 500’s 6%. It has been a while since Basic Materials has shown decent relative earnings performance. The XLB is a more heavily weighted to the traditional Chemical weighting in the Basic Mat sector. 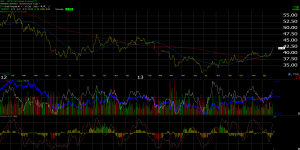 We do not own any XLB, and if we were to play the sector through ETF’s we would use the XME at this point. 3.) Freeport (FCX) is a little bit of a wildcard for us. The acquisition of MMO was pretty dicey, and the merger reduced FCX’s dependence on copper somewhat. 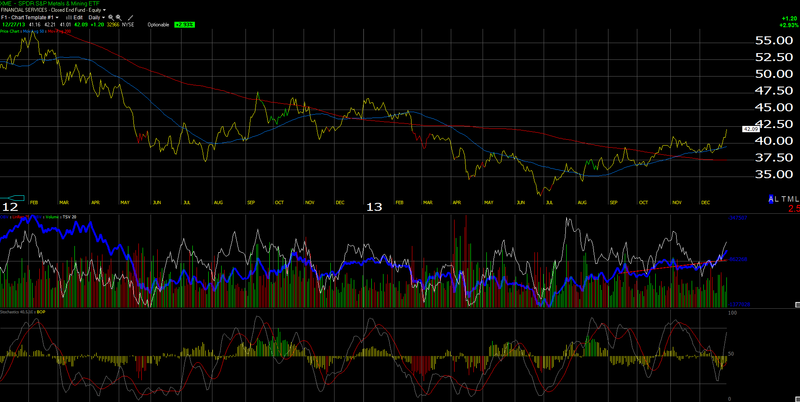 The recent pop in the price of copper from $3.40 to $3.80 has FCX perking up a little. All three stocks are dependent on aluminum pricing (AA), steel pricing (X) and copper pricing (FCX somewhat). We’ll be out with more individual analysis on these three later. For now, I particularly like the above 3 stocks into the July ’14 earnings reports, when comp’s will get tougher. We have full positions now in the three names although that could change. Our overall Basic Mat weighting in client accounts is 4% – 5% depending on the account, and that could change after we see q4 ’13 earnings in January. Alcoa will be the first to report in early January ’14. Thanks for reading. More to come this weekend.